1) On the upper left side of the website, next to the Advanced Search, we’ve added a “Current Promotions” button. 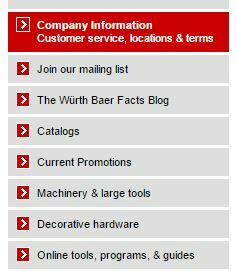 2) Or, on the lower right side menu on the home page of the website, you’ll find the “Current Promotions” menu button. This entry was posted in General, Improvements, Promotions and Sweepstakes, Website and tagged promotions, specials, website, Wurth. Bookmark the permalink.